Most advice about marketing on the Internet focuses on the top of the funnel, on acquiring new users to your website. Once they get to your website, however, most people have no idea what to do then and how to take them from a casual observer/reader/visitor to a potential customer. This is what middle of the funnel marketing is all about, and when done right it will build your business in amazing ways. Let’s talk about some of these. We already talked about Facebook ads as a top of funnel acquisition channel, but Facebook really shines when retargeting people who have already visited your website but did not yet buy or do an action that qualifies as the next step down the funnel. Implementing a Facebook retargeting campaign is very easy if you are on a platform like WordPress or SquareSpace and have the ability to add tags to your website using Google Tag Manager. For WordPress, plugins exist that make this incredibly easy, and many paid social media pros can help you set them up quickly if your technical knowledge is not sufficient to implement them. The basic logic of remarketing is this – when a person visits your site, you drop a virtual cookie onto their computer or web browser to mark that they have visited your page. Different data is stored depending on your setup. Then when the person goes back to Facebook (or a site using the Facebook Ad Network), they can be served an ad targeted at them because of the content they have viewed. You can do direct advertising (eg “come back and buy!”) or upsell them into a piece of content or something else. The goal is to bring them back to your website and continue taking them down the funnel, often by gathering their email address somehow. Probably the most effective mid funnel marketing channel is email marketing. There is a reason why basically every blog post or article talking about startup and digital marketing advises you to start building your email list as soon as possible. Do you love receiving letters in your mailbox? Many people do, especially when they are handwritten. And almost all of us hate spam and advertisements, especially when they clutter up our mailbox. I’m pretty sure mine is full with spam advertisements right now. Email marketing is similar. People love useful email that they have opted into and know to expect. If you’re in the market for a new home, receiving semi-frequent updates about the state of the real estate market in the area and fresh listings on the market is the greatest thing in world. While email marketing is a no-brainer for all businesses and especially real estate agents, it is also challenging because you must first acquire their email address. Luckily, doing so probably is not as hard as you think, though it still required work. Events, webinars, and online video hangouts are two great ways to engage those who have already engaged with your website and given you their email address or been added to a Facebook remarketing cookie group. Think of these as a direct way to educate and inform your existing audience about the things they care about. 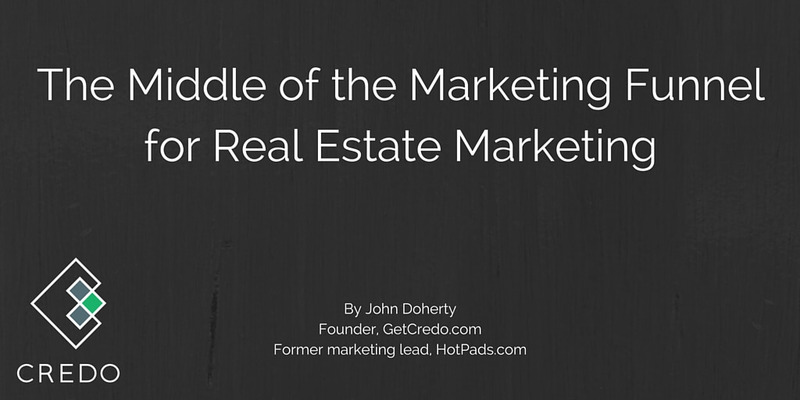 As a real estate agent, you’re the expert on the area and your potential customers are nervous about making what is likely the biggest purchase they have ever made in their life. Webinars and video Hangouts are an amazing way to connect directly with people. You can drive signups via your content and email marketing efforts, then spend the time answering their questions and setting their fears at ease. Also consider doing them in the evenings when people are more likely to be around and doing their research. We have already talked about content marketing as a top of funnel acquisition strategy, but it can also be a great mid-funnel marketing strategy. The kind of content you create will likely be different, as now you are using content to bring an already acquired user further towards a point of decision where they choose you as their agent. Content at this point in the funnel is really fun because you can directly measure what converts to customers assuming you have your Google Analytics (or other Analytics tool of choice) configured to track these. We talked about SEO as the biggest top of funnel acquisition channel. Mid-funnel SEO is where you get more specific with your keywords and target the terms that people are more likely to be searching for as they get closer to a decision. Here’s the best way to think about it. Let’s say that you have a real estate website for Denver, Colorado but you focus primarily on three neighborhoods – LoHi, Capital Hill, and Platt Park. As we talked about earlier, extreme top of funnel acquisition keywords are broader words like [denver real estate] or questions like [should I move to Denver?]. These are located at the beginning of the search funnel. Mid-funnel keywords become much more specific. 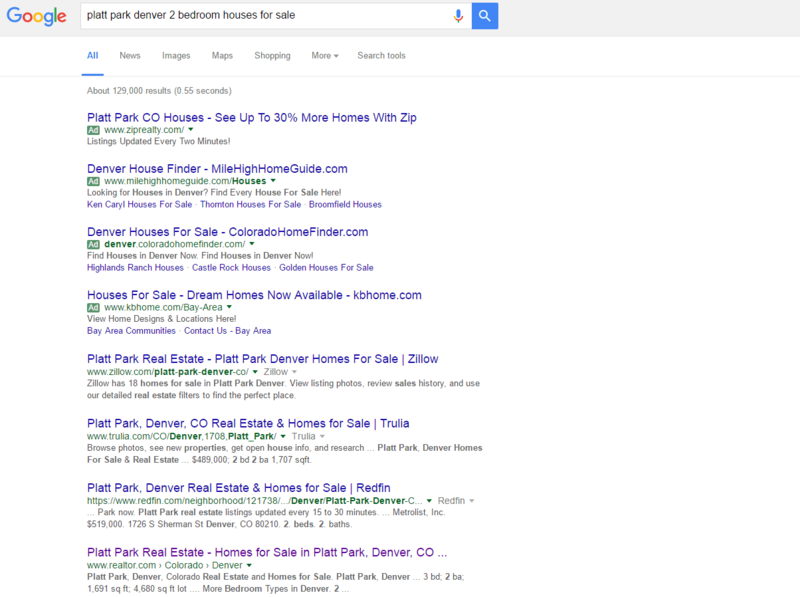 Now you have pages targeted towards terms like [platt park denver real estate], or even more specifically [platt park 2 bedroom homes for sale], because this person a) knows the neighborhood they want to live in, b) knows that they want a 2 bedroom house as opposed to a larger or smaller house, and c) that they want to buy instead of renting. This is also where the idea of a marketing funnel breaks down a little bit because these terms can also be the first place that the potential customer interacts with your brand. Thus, your funnel is shortened because you can know that they are already part of the way done with their home search and thus converting them into a customer will likely be shorter than someone coming from a more generic search.